The City Administrator is responsible for coordinating city resources and personnel to provide necessary services to the citizens of the community and to administer policies as adopted by the elected officials of the City of Fairfield. The Administrator reports to the Mayor and the City Council. Some of the duties and functions of the Administrator include coordinating the overall management of the city by developing and recommending policies, plans and projects to the City Council for consideration, and coordinating activities and communications between departments. S/he also assists the City Council in developing an annual budget by coordinating the collection of departmental information relating to capital improvements, staffing and facilities; coordinating budget review meetings and public meetings. S/he also resolves complaints, problems or concerns with city services, programs or policies by meeting with the public to clarify concerns and coordinate city efforts to correct the situation. Aaron Kooiker is Fairfield's City Administrator. Aaron was born in Clinton, Iowa and raised in Sioux Center Iowa. He began his public service degree as a police officer in Polk City, Iowa and then in West Des Moines, Iowa. He also spent 4 years as an instructor at the Iowa Law Enforcement Academy. 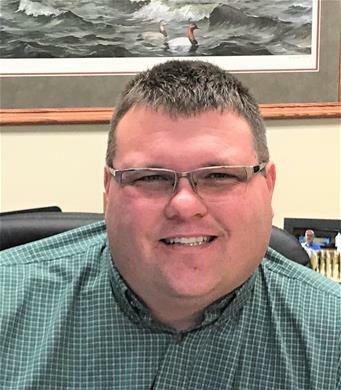 Aaron has served the past five years as City Administrator in Hull, Iowa. Aaron’s family includes his wife, Michelle, and two sons Asthon (20) and Landon (16). Aaron earned a BA in Sociology from the University of Iowa. He lettered in football from 1993 through 1995, playing right tackle on the Hawkeye offensive line in the Sun Bowl in 1995. He also earned a Master of Public Administration from Bellevue University. Aaron has enjoyed coaching over the past 14 years in football and track. He also is an avid outdoorsman.